Faculty members in the School of Education were feeling a double pull: they needed time to write, and they wanted to unite toward a goal and get to know each other better. A couple of things converged to make the idea click in her mind, Chandler-Olcott says. First was learning that November was National Novel Writing Month. Second was the school’s participation in the campus’s Walktober event. There was so much enthusiasm among School of Education faculty and staff members for Walktober that they needed to establish a second team to accommodate everyone. “People wanted to band together and set goals,” Chandler-Olcott says. 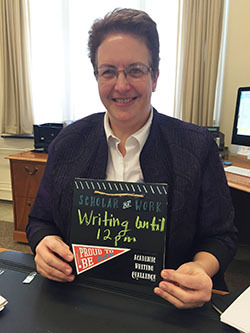 In interviews with faculty, Chandler-Olcott found that they struggled to find time for writing and scholarship. “When pressures mounted, they would make the choice to support others, and not put themselves first,” she says. One goal of the writing challenge is to change this emphasis and encourage faculty members to put themselves first for at least that half hour every day. 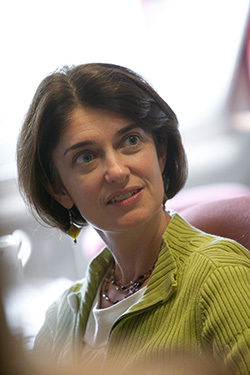 Twenty-five faculty members signed up for the challenge, including Dean Joanna Masingila, who says she has set a goal of completing two projects during the 30 days. Elisa Macedo Dekaney, who straddles the School of Education and the College of Visual and Performing Arts as the chair of the music education program, has been working on several projects. She has completed composing a three-part song for her Brazilian Ensemble, and is still gathering sources for a book of Brazilian folktales. 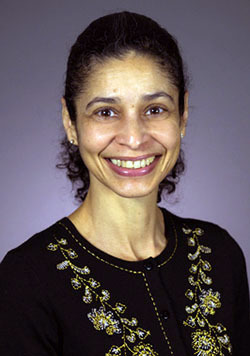 The last project, which she needs to finish by March 1, is a study investigating the attitudes of pre-service music students in regard to race, gender and disability in the music classroom. Masingila believes the challenge has been a great idea. “I believe the momentum and community will carry on beyond the 30 days,” she says.